Keith will debut the guitars on HSN Nov. 3. 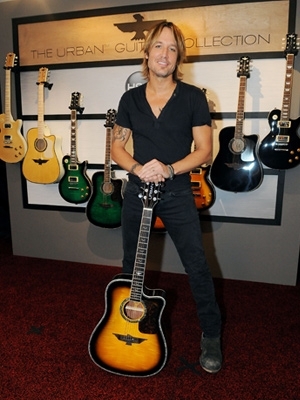 Keith Urban has been known to give away a guitar to a lucky fan during his concerts, but now all music lovers have a chance to play a Keith instrument. The country star is set to unveil a new signature line of guitars Nov. 3 on shopping network HSN. The Urban Guitar Collection, available in four different color schemes, features electric and acoustic options of the “Phoenix Edition” guitar, along with a two-hour instructional DVD. Keith made the announcement prior to his performance in Tampa, Fla., on Friday evening (Oct. 4). A portion of the proceeds from the guitars will benefit two music-minded charities, Mr. Holland’s Opus Foundation and the Grammy Foundation. Keith is just the latest country star to produce his own line of guitars: Toby Keith, Taylor Swift and Brad Paisley also have their own signature products. New album “Tangled Up” arrives Sept. 23, and Thomas Rhett plans to have a bunch of friends helping him celebrate. Country Nation College Tour presented by Zaxby's kicks off at Virginia Tech. Performances from Roundhouse in London will be streamed live to fans everywhere. © 2015 Cumulus Media, Inc. All Rights Reserved. Part of The American Media Inc. Celebrity News Network. Visit our other publications.